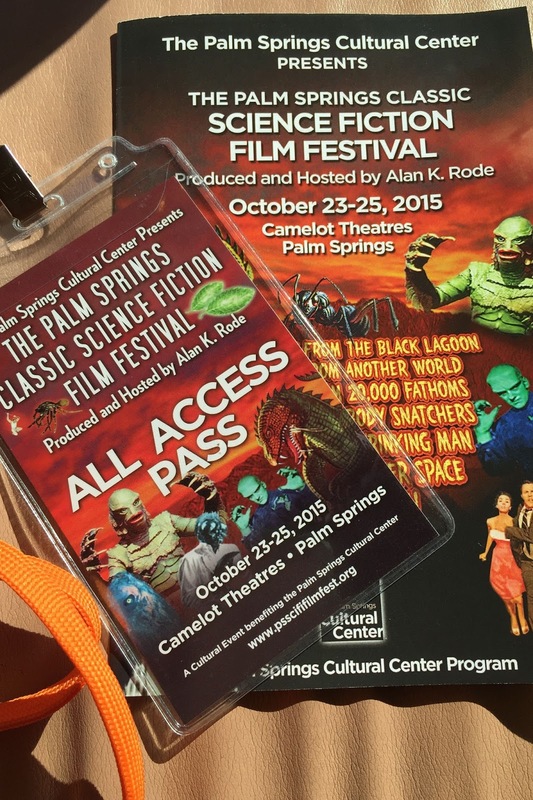 This weekend I was fortunate to enjoy a wonderful time at the Palm Springs Classic Science Fiction Film Festival! 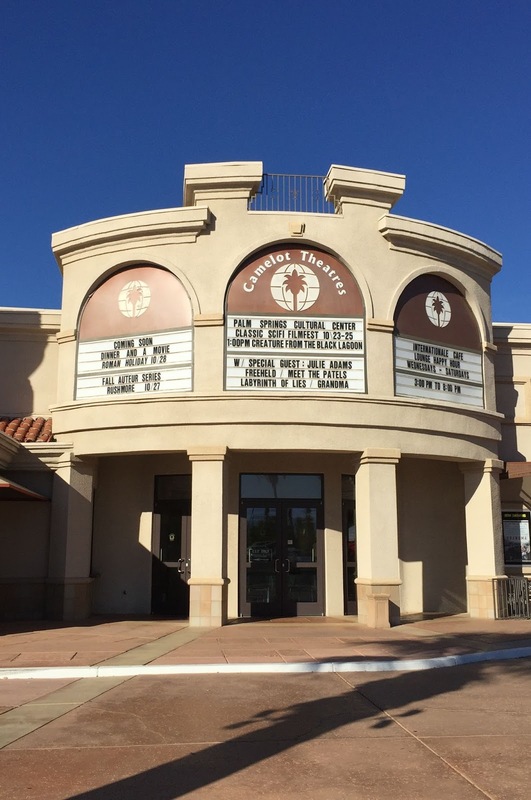 The festival was held at the Camelot Theatres in Palm Springs, where six months ago I also attended the Arthur Lyons Film Noir Festival. Both festivals were expertly produced and hosted by Alan K. Rode, and it's safe to say that thanks to Alan's great work I'm a convert to the Palm Springs festival experience! 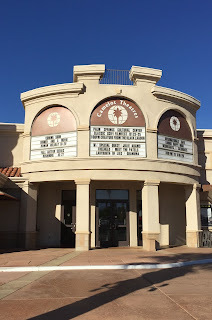 It's a relaxed and congenial setting with time for plenty of movies but with enough down time built into the schedule to relax a little in between screenings. Alan's knowledgeable intros provide interesting background and humorous insights into each of the movies shown. The festival kicked off on Friday evening with star David Hedison in attendance at a screening of THE FLY (1958). I missed that film, but I was there for every one of the seven films shown on Saturday and Sunday! I've previously written here that I came to watching '50s science fiction relatively late, but I'm certainly making up for lost time! 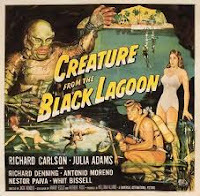 I'd previously seen two of this weekend's films; I reviewed CREATURE FROM THE BLACK LAGOON (1954) in 2011 and IT CAME FROM OUTER SPACE (1953) in 2012. 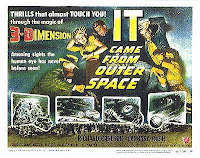 Both films were originally shown in 3D but were shown "flat" at the festival. The other five films were all new to me. What a great experience! The prints were all excellent. I loved three of the movies, liked a fourth, and appreciated seeing the last title, though I found it a bit exhausting to watch. To find out which is which, stayed tuned for my upcoming reviews; I suspect some of my most faithful readers might even be able to predict in advance which ones I liked best! 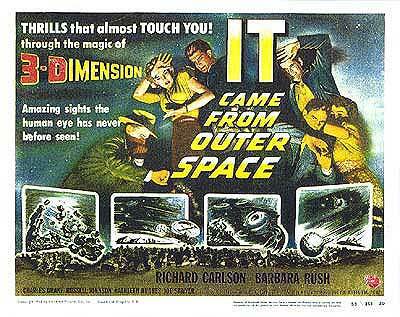 Watch for posts in the near future on the films which were new to me; in order of viewing, they are INVASION OF THE BODY SNATCHERS (1956), THE BEAST FROM 20,000 FATHOMS (1953), THE INCREDIBLE SHRINKING MAN (1957), THE THING FROM ANOTHER WORLD (1951), and THEM! (1954). The wonderful Julie Adams made the trip to Palm Springs to greet fans at the screening of CREATURE FROM THE BLACK LAGOON. It's always a treat to see her! What a friendly, gracious lady. After the film, Alan interviewed Julie, along with her son Mitchell Danton, who worked with Julie on her memoir THE LUCKY SOUTHERN STAR and is very knowledgeable about his mother's career. 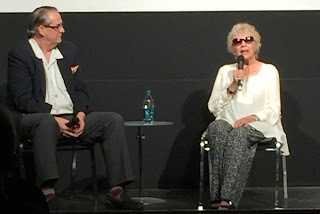 Julie said she never dreamed audiences would still be interested in CREATURE 61 years later! She said when she'd looked at the script she thought it would be fun to make and it was, adding "I was a pretty good screamer!" She said that making a movie in 3D was fun in its way, "part of the challenge." She had particularly high praise for director Jack Arnold, saying, "You could understand him, and he knew what he wanted." The interview was filmed and will be available on the internet at a future date. For more of Julie's memories, please visit my account of her 2011 interview with Alan at the Egyptian Theatre. Kathleen had helped make 3D tests at Universal before the picture was filmed and very much wanted to be in a 3D movie. Although Universal was initially reluctant to cast the up-and-coming actress in a supporting role, she convinced them. Her part might have been relatively small -- though memorable! -- but the publicity stills she shot for the film have had a life of their own, even turning up on birthday cards! During her interview with Alan Rode, which was also filmed, Kathleen spoke charmingly of her courtship with producer Stanley Rubin. She had initially brushed him off when he'd first asked her out, but when an acquaintance later told her he was "one of the nicest guys in Hollywood," she asked her friend to tell him she'd go out with him. 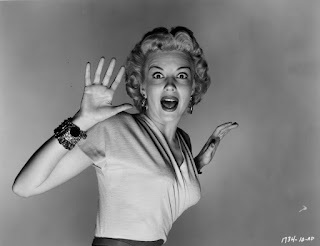 Stanley asked her out again, and she said when he showed up for the date -- which included a studio screening of his film RIVER OF NO RETURN (1954) -- her feelings toward him had completely changed. 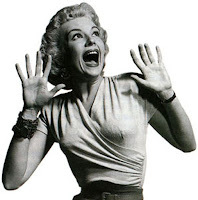 She said when she opened the door and saw him, it was as though she'd been hit by "a bolt of lightning" and she would have married him on the spot! As a matter of fact, they married just two months later and were happily married for 49 years, until Stanley passed away early in 2014. I was fortunate to attend a moving tribute to Stanley Rubin at the Egyptian Theatre a few weeks after his passing. As we took in this view leaving Palm Springs last evening, I couldn't help thinking that it looked like it could be a shot in a science fiction movie! As a postcript, I again stayed at the Best Western Plus Las Brisas Hotel and was very satisfied with the experience. It's conveniently located just minutes from the festival site. We especially enjoyed our dinner at Bill's Pizza on Indian Canyon Boulevard and recommend it to future festival attendees. I'm hoping to return to Palm Springs for more film noir and science fiction in 2016! It was a great pleasure to be one of those attending the inaugural edition of a wonderful science fiction festival. I'll be adding all the festival review links to the end of this post so that they can be easily found in one place. Previous festival preview posts: Coming Next Weekend: The Palm Springs Classic Science Fiction Film Festival; Coming Soon: The Palm Springs Classic Science Fiction Film Festival. Festival review links: Tonight's Movie: Invasion of the Body Snatchers (1956) at the Palm Springs Classic Science Fiction Film Festival; Tonight's Movie: The Beast From 20,000 Fathoms (1953) at the Palm Springs Classic Science Fiction Film Festival; Tonight's Movie: The Incredible Shrinking Man (1957) at the Palm Springs Classic Science Fiction Festival; Tonight's Movie: The Thing From Another World (1951) at the Palm Springs Classic Science Fiction Festival; Tonight's Movie: Them! (1954) at the Palm Springs Classic Science Fiction Festival. Sincere thanks to Alan K. Rode for providing an All Access Pass to help facilitate my festival coverage. You clearly had a great time at Palm Springs, Laura, and are once again to be envied! It would be hard to better the selection of films you saw there and I look forward to finding out more about those you loved (and only liked etc) as you write on them! Thanks, Jerry! I only wish that some of you film fans who are so far away could have been there also. You would have loved it! My first review, of INVASION OF THE BODY SNATCHERS, will be posted later today! Thanks so much for your interest. These Palm Springs festivals sound so lovely. I'm more interested in the Noir fest, but the timing would work out better with the sci fi. I'll probably have to wait a few years to attend anyway. I hate to leave the girls too much at this age. They're growing so fast! Thanks for the great overview.